Origin Cash For cars pays highest cash for unwanted or scrap cars in Newcastle and surroundings suburbs. Why not scrap your car for cash today and receive free car removal service. If you want to make hassle free cash from your old rusted car that’s no more of any use to you, then contact us to get highest cash for cars up to $8999 on the same day! We’ve been serving all Newcastle suburbs since 1990 and offer genuine valuations for all types of vehicles, including jeeps, vans, trucks, 4WDs and even bikes or boats. We buy everything!!! Sometimes old, rusted cars or other vehicles can be a big headache and you cannot hope to get good cash for cars, as you won’t be able to find any buyers. You also cannot dump your car or other vehicle just anywhere as you will have to pay a big amount as towing charges. Most of the time, the car has no selling value. We always pay you best cash for car up to $8999 with speedy same day removal. Do I Need To Be Present When My Car is Being Towed? You should be there at the pickup time to provide us the proof of the ownership before we pay cash for cars. You can show us your driver’s license and vehicle papers. If title is in your name, you can designate someone to do the transaction on your behalf. SIMPLE! Isn’t it? Why Sell your Old Rusted Junk Car to Us? The biggest reason to sell your old car to us is that we pay you the BEST POSSIBLE PRICE for your old car. Secondly, there are no towing charges and we always ensure pick up at your preferred time. We buy all vehicles including trucks, boats, bikes, vans, jeeps, 4x4s, 4WD and SUV’s. You just need to call us on phone or contact us online to receive cash for cars quote. Just provide us some information about your vehicle and soon our team will be back with the FREE no obligation quote. Once you accept the quote, we will schedule a pick up time, reach your place, complete the papers, pay cash for cars and tow it away for free. We use a specific set of criteria for evaluation the real value of your old car. Once you’ve provided all the information to us over phone, we will just verify this information once when we come to pick up your old car. Once you’ve accepted our no-obligation free quote, we will schedule an appointment in no time for same day removal of your vehicle from your premises or whenever that is convenient for you. We will quickly dispatch a tow truck to your place to pick up the vehicle, mostly within few hours of your first call. We then offer you cash payment right on the spot. We can pick up vehicles in any possible condition. However, you also need to inform our team if you fee that your old car cannot be towed away by a conventional tow truck and instead needs a wrecking crew for the job. If you have multiple vehicles we can still remove it at the same time. All you need to do is to just inform us how many of these you want removed so that you can include their real value on the quotation we will offer you. We can pay cash for European, Japanese and all types of domestic models. Approach us even if you have a BMW, Toyota, Mercedes, Mitsubishi, Mazda, Jeep, Land rover, or Isuzu. Call us today and get free quote for your vehicle any condition, any location and any make. 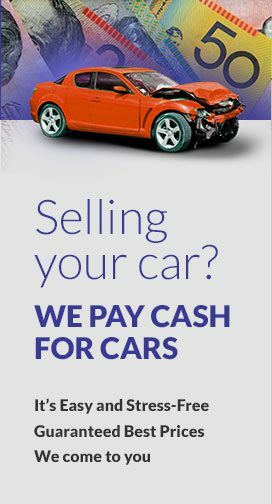 Our firm has been in this cash for cars trade since 1990 and have gained rock solid reputation for being a most reliable firm that offers TOP DOLAR for unwanted, junk cars that owners are no longer interested in. Our cash for cars team is always ready and we always come on time and can even ensure same day removal on weekends. We have a really huge inventory of tow trucks and other useful tools that make our process seamless and easy. We also do not charge even a dime as towing fee to carry away your junk. To ensure SAME DAY REMOVAL and cash for cars up to $7000 contact us at: 0434 450 140 or submit an online enquiry form, We will quickly give you a FREE quote and if that’s approved, we will quickly reach your place within hours and offer promised cash for cars after completing the necessary paperwork.